About six years ago, director Garry Marshall, who got his start in television but went on to a fairly successful film career, went back to his roots with a pair of holiday-themed films that resembled an episode of The Love Boat with an A-list cast. Marshall was able to get the likes of Robert De Niro, Julia Roberts, Michelle Pfeiffer, Jamie Foxx, Shirley MacLaine, and Halle Berry, along with a host of other familiar faces, to appear in Valentine’s Day and New Year’s Eve. The films only got a lukewarm reception, both critically and at the box office, but at least they had a built-in marketing gimmick. Now, five years later, Marshall is back, as is Julia Roberts, for Mother’s Day, and, once again, Marshall is consistent, both in terms of quality and theme. As you might guess, Mother’s Day is largely the story of four families (and I use the term somewhat loosely here), who face a variety of crises in the days leading up to the holiday. First and foremost, at least in terms of screen time, is Sandy (Jennifer Aniston), a single mother of two boys whose husband Henry (Timothy Olyphant) walked out on her. Sandy’s hopes for a reconciliation are dashed when Henry reveals that he has in fact married a much younger trophy wife, Tina (Shay Mitchell). Tina’s only apparent talent is filling out a bikini nicely, but she does want to get to know Sandy’s children better, and Henry proposes that the boys spend part of Mother’s Day with him and Tina. Naturally, Sandy gets rather miffed. Sandy’s friend Jesse (Kate Hudson) has problems of her own. Jesse’s parents (Margot Martindale and Robert Pine) are stereotypical Texas redneck bigots, and Jesse has neglected to tell them that her husband Robert (Aasif Mandvi) is Indian. To make matters worse, Jesse’s sister Gabi (Sarah Chalke) has married another woman, Max (Cameron Esposito), and Mom and Dad don’t know about Max, the marriage, or the lesbian couple’s son. Nonetheless, the parents are barreling across country in their RV to pay a surprise visit to their daughters. The biggest name in the Mother’s Day cast, Julia Roberts, is a mom with no reason to celebrate the holiday, since she had to give up her baby for adoption years before. That didn’t stop her from becoming a shopping channel multimillionaire or sporting an atrocious Buster Brown-style red wig for the entire movie, or from procuring the services of Marshall mainstay Hector Elizondo as her manager. So, when a young waitress, Kristen (Britt Robertson), won’t agree to marry her boyfriend (and father of her child), Zack (Jack Whitehall), because she has commitment issues because she was adopted and never knew her birth mother, what do you think the chances are that the two storylines will intersect? Finally, there’s a man with his own set problems on Mother’s Day. Bradley (Jason Sudeikis) is a nice guy facing his first holiday without his wife, who was killed in Afghanistan a few months earlier. Instead of moving on with his life, however, he spends his spare time watching old videos of his wife and fumbling badly as a tremendously overprotective single parent of two daughters. Although Doc, Julie, Isaac, and Gopher never had to deal with a lesbian married couple on The Love Boat, all these other family problems were right up their alley. And TV audiences could expect the guest families on each cruise to be hopelessly messed up by the halfway point in the show, only to have everything resolve itself by the time the shipped docked again in Los Angeles. Mother’s Day is twice as long as a typical Love Boat episode, and the only water in sight is glimpsed briefly in Henry’s swimming pool, but otherwise there’s not much difference between the two. In fact, Aniston, Sudeikis, and company are exactly the type of actors we’d expect to see on an updated version of the TV show. Of course, for all the problems depicted in Mother’s Day to work themselves out during the course of a two-hour movie requires both some extremely simplistic philosophizing (“We’re not who the world thinks we are; we decide who we are”) and a lifetime of psychological hang-ups that disappear within five minutes of seeing one’s mother or a baby. Kristen has self-confessed abandonment issues, but five minutes with Mom and she’s walking down the aisle with her boyfriend. Jesse’s parents are shopping for white hoods to wear in one scene and cooing over a grandson in the next. Normally, I wouldn’t spoil a movie by mentioning how major plot issues get resolved, but the surprise in Mother’s Day would be if they didn’t get resolved in such a simplistic manner. There’s only one plot development in the entire movie that’s the least bit original, and that concerns the least heralded major character, Zack, who, it turns out, is an aspiring nightclub comic who manages to incorporate his daughter into his act and win an open-mike competition by extolling the wonders of Kristen as a mother. That’s also one of the few scenes in the movie that displays genuine wit, rather than stale one-liners, a silly car chase involving an RV without brakes, bad slapstick, and sitcom chestnuts such as the embarrassed man trying to buy tampons. A few of these work, but most wouldn’t have made the cut on any of Marshall’s earlier TV shows. Whitehall, who is a British comic, at least gets to play to his strengths; other talented actors founder a lot. Yet, this latest directorial version of Garry Marshall (he’s now 81) does indicate some marketing savvy. If you can’t make a movie that’s actually good, and you don’t have the A-list cast you once did at your disposal, at least make a movie that even today’s studio execs could promote successfully. Mother’s Day is schmaltzy and sentimental as all get out, but it’s got a solid performance by Jennifer Aniston at the core and one parent, at least, who to some extent merits audience empathy. And, quite frankly, it’s pleasant to sit through, at least for audiences taking a wife or mother out for the holiday and who are already pre-disposed to appreciate the film’s Hallmark card level of sentiment. 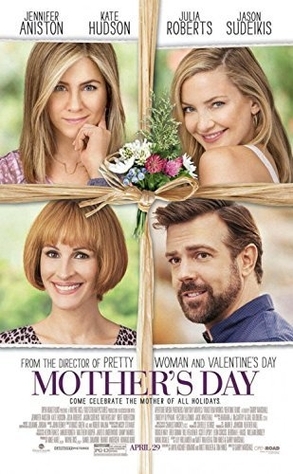 I’m giving Mother’s Day the benefit of a huge doubt by rating it as highly as I do here, but there are a few moments here and there that did hit the spot, and one offbeat enough romance set around a comedy club that I wouldn’t have minded seeing go on longer. It’s still not a good movie by any stretch of the imagination, but it’s one that audiences on this particular holiday probably won’t mind seeing.